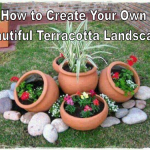 Why Not Make Your Own Clay Pot Candle Holder? 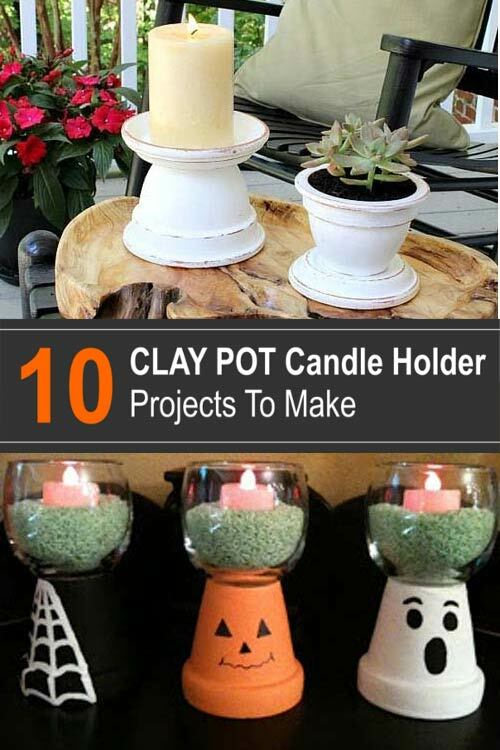 A clay pot candle holder is no longer just about holding a candle. For some, it would be considered a serious decorative piece. can make a major difference to the ambiance of your room. 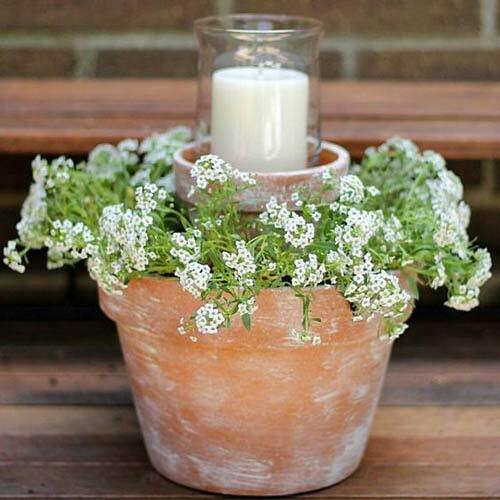 A simple clay pot candle holder can be used to frame an elaborate or ornate candle, whereas a more decorative candle holder can make a simple pound store candle look amazing. In fact, the entire look and feel of your room or your garden can be changed completely or enhanced with the right candle holder. 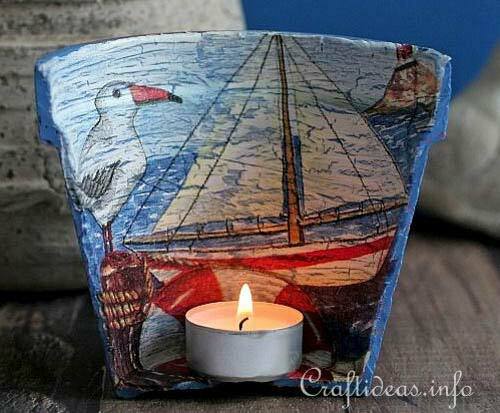 There are many ways in which you can change the look of your area with candle holders, here are but a few. 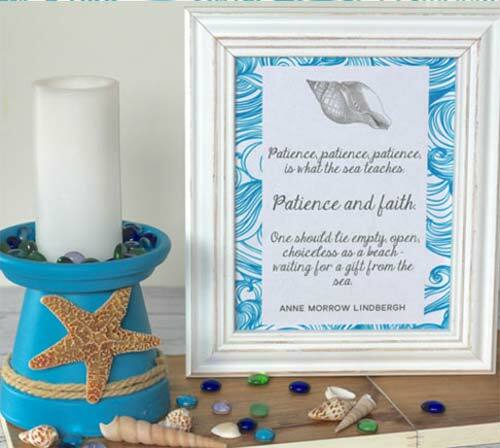 A simple candle holder with a plain white candle creates a minimalist feel, calming and serene. Use medium to large candle holders in bolder colors or more ornate designs to create an amazing statement piece. Really bold colors and designs make for a vibrant space. 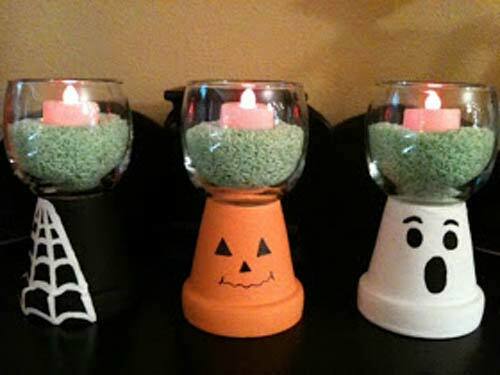 You can make pieces that celebrate special occasions such as birthdays, Christmas, Halloween or national holidays as in the 4th of July candle holder below. Set a theme for a room, make it fun or chic or classy. If like me you just like making things, you can always make them and give them away gifts. They make wonderful presents. 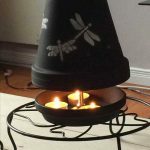 So here they are 1o different clay pot candle holder tutorials for you to have a go at making. Requires only one pot and one sauce, plus the detail decorations and paint of course. Simple but effective. 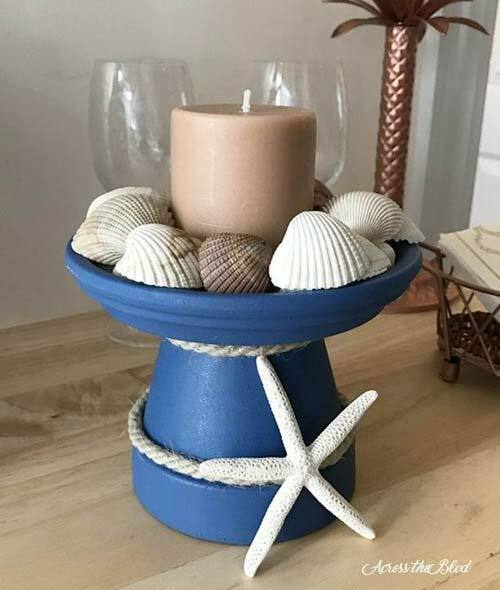 The candle holder is painted in blue and dressed up with rope and a starfish ornament. 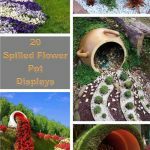 They have made this a real centerpiece by making a matching picture frame with image and scattering around glass beads and shells. 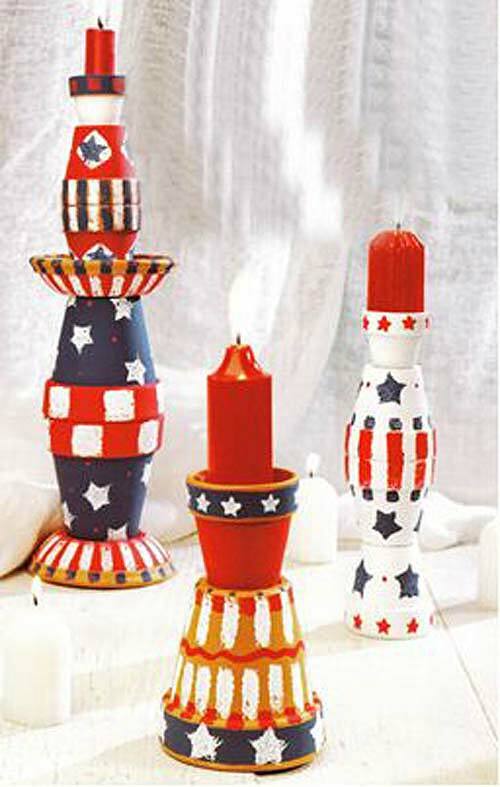 Three different height and shape candle holders all set to the 4th of July theme. Using different combinations of pots and saucers and painting on stars and stripes to give them that patriotic feel. 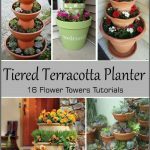 Don’t throw away your broken clay pots, there are many ways you can reuse them. 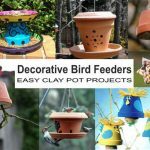 From candle holders like you see here, to fairy gardens and you can even use them in landscape gardening. 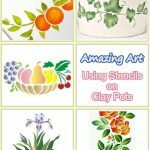 When it comes to celebrating your clay pot candle holders can get really interesting. 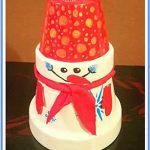 You can find tutorials for all types of celebrations, birthdays, Halloween, Christmas and many more. 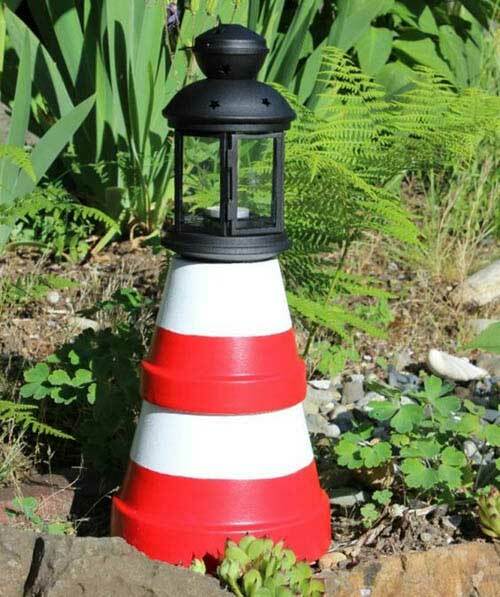 Clay pot lighthouses can be made for indoors or out. They can be simple like this one or massively fancy. 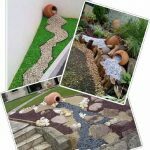 You can make tiny ones to fit on your side indoors, or build them huge and make a real feature point for your garden. This clay pot candle holder is both elegant and classy. 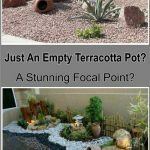 Combined with a citronella candle you can add function as well. 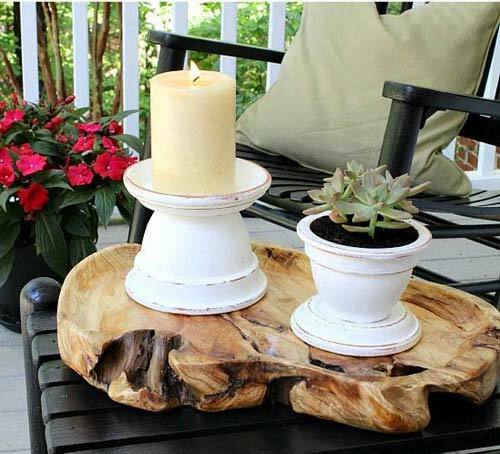 This quick and easy outdoor planter come candle holder would look lovely set into any border. 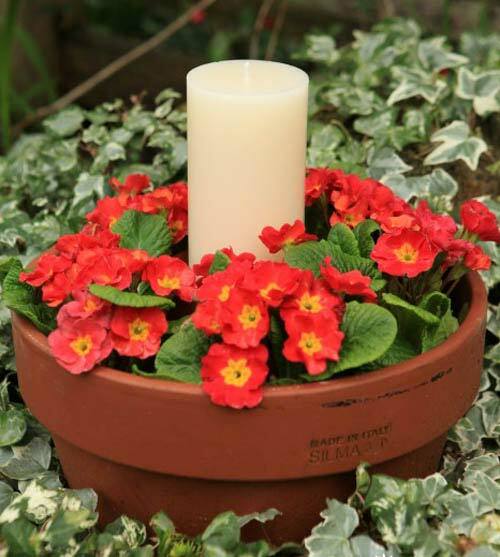 An attractive outdoor display which comes complete with a cover to help stop your candle from blowing out. Well, that says it all really. 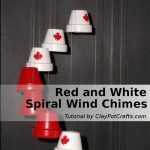 This simple project would make a lovely table centerpiece. 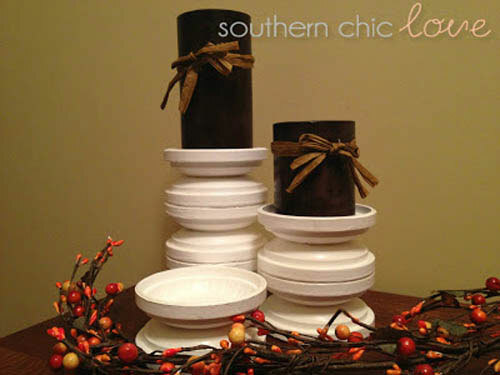 By simply stacking and gluing saucers you can add as much or as little height as you wish to your clay pot candle holder. So there you have it, clay pot candle holders are amazing, versatile and so much fun.